IDAHO FAllS, Idaho ー Roy Southwick, east Idaho’s first weatherman, local radio icon and broadcast pioneer, has passed away at the age of 97. 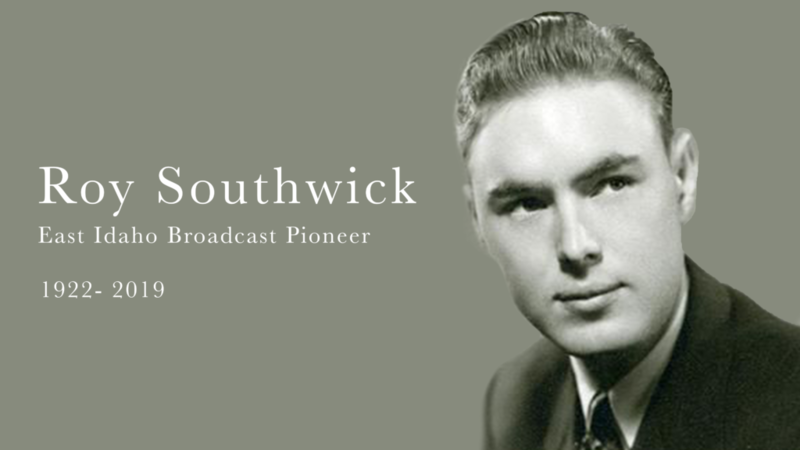 Southwick’s journey into radio was a happenstance situation, but one that would impact the region for decades to come. After serving in the armed forces, marrying his sweetheart Doris and working on the local railroad, Southwick’s wife encouraged him to try working at the local radio station, KID NewsRadio. Ackerly asked the young Southwick what he could do, to which Southwick offered up his singing voice. After favoring the radio program director with a small tune, Southwick tried reading a radio script and before he knew it, Ackerly had offered him a job as the weekend announcer between the variety of productions and shows on KID. Within a few years, Southwick went from a weekend radio announcer to program director at KID NewsRadio. It wasn’t long before Southwick diversified his radio career with television. Southwick was a quick study though and in short order, east Idaho’s one television station was exclusively carrying each of the available stations. Throughout his career, Southwick’s passion for broadcast was contagious. According to his obituary, he often remarked, “I never have had a day that I wished I didn’t have to go to work.” Southwick’s dedication to his craft impacted individuals and the entire region alike. Southwick is survived by his wife, Mable Judd Southwick, one daughter, two songs, 11 grandchildren and 25 great grandchildren. He was preceded in death by his wife, Doris; daughter, Debra Hill; son, David Southwick; brother, Glen Southwick; and sisters, Melba Fields and Gail Clegg. Funeral services will be held at 11 a.m. Saturday, March 9, 2019, at Idaho Falls Central Stake Center, 2025 Jennie Lee Drive. Roy L. Southwick, 97 years of age, passed away in good health, at his home, surrounded by his family on March 5, 2019. Dad was born January 11, 1922, in Ammon, Idaho, to Alfred Leroy Southwick and Pamelia Losser Southwick. He was raised on a farm, which is presently known as the Southwick addition, in Hillview.